Independence Bed Skirt - Queen, by Ashton & Willow. Independence Bed Skirt is classic red and tan plaid. Ruffled and finished with split corners. Fits mattress sized 60 x 80 inches, with 16 inch drop. Note: SPECIAL ORDER - We are offering this item a special order for those interested in adding on to their quilt purchases. 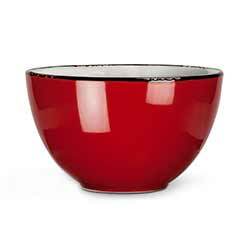 We do not stock this in house - NO RETURNS on this item. Ships in 1-2 weeks. Independence Bed Skirt - King, by Ashton & Willow. Independence Bed Skirt is classic red and tan plaid. Ruffled and finished with split corners. Independence Bed Skirt - Twin, by Ashton & Willow. Independence Bed Skirt is classic red and tan plaid. Ruffled and finished with split corners. Independence Curtain Panels (63 inch), by Nancys Nook. 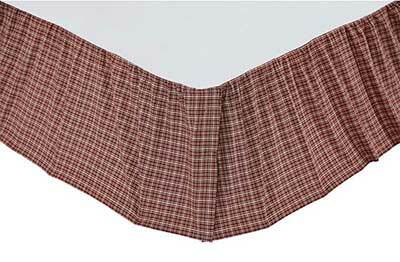 Independence Scalloped Short Panel Set is a rusty red on tan simple plaid, featuring lining and scalloped edges. Lined. Independence Curtain Panels (84 inch), by Nancys Nook. Independence Scalloped Panel Set is a rusty red on tan simple plaid, featuring lining and scalloped edges. Lined. Independence Prairie Curtain (63 inch), by Nancys Nook. 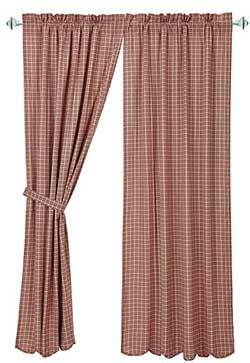 Independence Scalloped Prairie Curtain Set is a rusty red on tan simple plaid, featuring lining and scalloped edges. Lined. 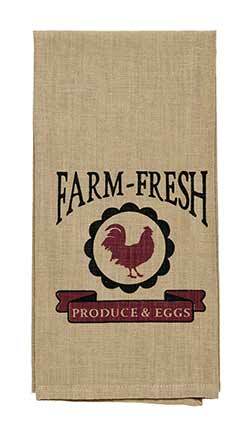 Independence Prairie Swag (36 inch), by Nancys Nook. Independence Scalloped Prairie Swag Set is a rusty red on tan simple plaid, featuring lining and scalloped edges. Lined. Independence Quilt - King, by Ashton & Willow. Celebrate patriotic décor with our USA flag-inspired Independence patchwork quilt. The stars and stripes are prominently featured in the quilt center with a reverse seam construction for added effect. Border and reverse are a large blue and tan plaid. Outward facing patch stars are in each corner. Independence Quilt - Luxury King, by Ashton & Willow. Celebrate patriotic décor with our USA flag-inspired Independence patchwork quilt. The stars and stripes are prominently featured in the quilt center with a reverse seam construction for added effect. Border and reverse are a large blue and tan plaid. Outward facing patch stars are in each corner. Independence Quilt - Queen, by Ashton & Willow. Celebrate patriotic décor with our USA flag-inspired Independence patchwork quilt. The stars and stripes are prominently featured in the quilt center with a reverse seam construction for added effect. Border and reverse are a large blue and tan plaid. Outward facing patch stars are in each corner. 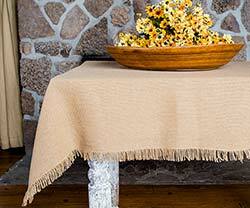 Independence Scalloped Table Cloth - 60 x 102 inch, by Nancys Nook. 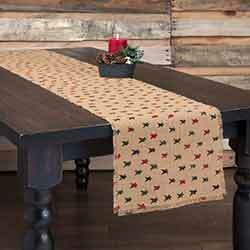 Independence Scalloped Table Cloth brings a patriotic look to table settings with red/tan plaid ground and a navy appliqued star in each corner. 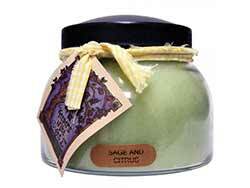 Independence Sham - Luxury, by Ashton & Willow. Celebrate patriotic decor with our hand-quilted Independence Luxury Sham, featuring an appliqued star on red/tan plaid ground. 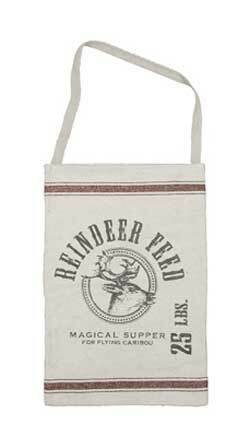 Reverses to tea-dyed cotton flax, with 3-tie closures. 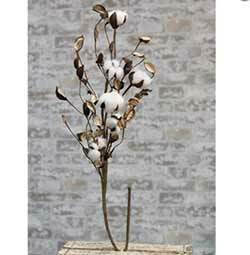 Independence Sham - Standard, by Ashton & Willow. Celebrate patriotic decor with our hand-quilted Independence Standard Sham, featuring an appliqued star on red/tan plaid ground. Reverses to tea-dyed cotton flax, with 3-tie closures. Independence Swag (36 inch), by Nancys Nook. Independence Scalloped Swag Set is a rusty red on tan simple plaid, featuring lining and scalloped edges. Lined. Independence Table Runner, 48 inch, by Nancys Nook. Independence Runner brings a patriotic look to table settings with three large appliqued stars in a white/navy ditsy star fabric, appliqued on a rusty red plaid. Back side reverses to the star print, so it is reversible for two looks! Independence Throw (Quilted), by Ashton & Willow. Celebrate patriotic decor with our USA flag-inspired Independence patchwork throw. The stars and stripes are prominently featured in the quilt center with a reverse seam construction for added effect. Border and reverse are a large blue and tan plaid. Outward facing patch stars are in each corner. Independence Tiers (36 inch), by Nancys Nook. Independence Scalloped Tier Set is a rusty red on tan simple plaid, featuring lining and scalloped edges. Lined. Independence Valance, by Nancys Nook. Independence Scalloped Valance is a rusty red on tan simple plaid, featuring lining and scalloped edges. Lined.